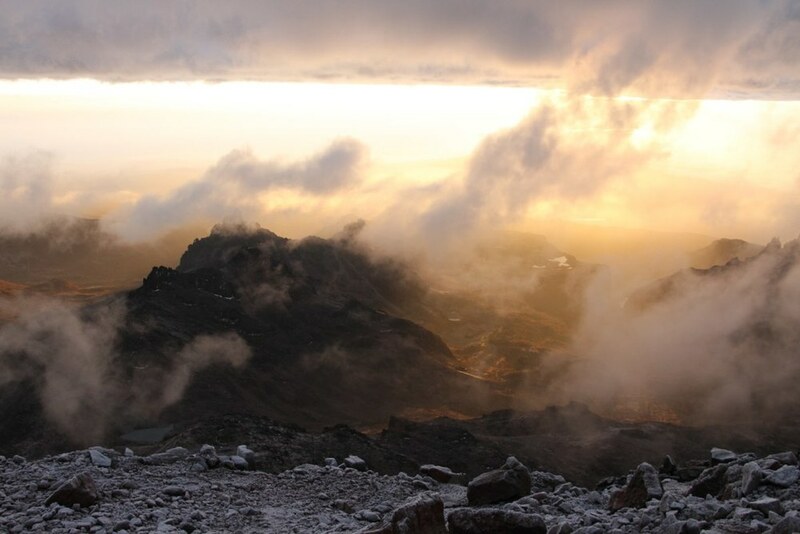 Mount Kenya is often considered the most striking and rugged mountain in East Africa. It’s summit is a triple crown of three jagged peaks, guarded on most sides by near vertical rock faces. Our high point is Point Lenana, at 4,985m, which we’ll reach after four days of trekking. During the trek we’ll pass through tropical woodland, moorland, rocky alpine terrain and bamboo forests. This variety of scenery, combined with sightings of monkeys, buffalo and possibly elephants, makes this a very special experience. We work with a number of beautiful lodges and hotels around Mount Kenya National Park to make sure that the experience is a high standard throughout the trip. A high quality 2 person mountain tent is provided, with a foam pad to sleep on. Dining tent with lightweight table and stalls, toilet tent, and transfers in coasters/ private buses. With our Skyline specification the team will be sure to be staying in the best accommodation on the mountain. You will be sleeping in a large standing height tent, with full size sleeping cot, 3 inch foam mattress, pillow and -18 celsius sleeping bag for the best nights sleep. Private toilet and shower tents will also be provided. A large mess tent is provided for dining and socialising which has comfortable backed chairs and large tables for enjoying the 3 course meals in comfort. Tea & fresh pressed coffee available. Transfers in private 4x4 safari vehicles. Arrive at Nairobi Airport and transfer to the hotel where the team will meet the Guides. A full trip briefing and gear check will be carried out. Overnight at Hotel. Early in the morning you'll be picked up from the hotel and transferred to the Sirimon Park Gate (alt.2700m). After a picnic lunch, you'll start an acclimatization hike in the tropical woodland, occasionally enjoying the sightings of monkeys, buffalos or possibly elephants. Arrive at Old Moses Camp (alt.3200m) in the early evening. After breakfast, you'll start the hike across moorland vegetation, enjoying the picturesque views of the Sirimon and Mackinders valleys, arriving at Likki North Hut in the early afternoon. Lunch at this camp and later take an acclimatization walk around the camp. Today you will start hiking up a steep slope towards Shipton’s Camp (4,200m) arriving in time for lunch. The giant groundsels along this route are some of the most spectacular on Mt Kenya. Afternoon walk to the Kami Hut and later back to the camp for dinner and overnight. Summit Day! At 0300hrs you'll be woken up by the camp crew and have some tea and biscuits. You'll then start the attempt on the scree and rock to the summit; Point Lenana (alt.4985m), which is the highlight of your trip! After taking photos with the sunrise, descend slowly down to Mackinder’s Camp for breakfast. Then continue down the steep bog to the Met Station (alt.3050m). Afternoon resting, dinner and overnight at Met Station. At 0800hrs you'll depart the camp and walk through the bamboo forest to connect with the private transfer vehicle at the Naro Moru Gate. From here you will head back to Nairobi for a well-deserved shower and celebratory dinner & drinks! Overnight Hotel/ transfer to airport for flights home. Transfer to Nairobi Airport or onwards to a safari for those who would like to book this as an extra. 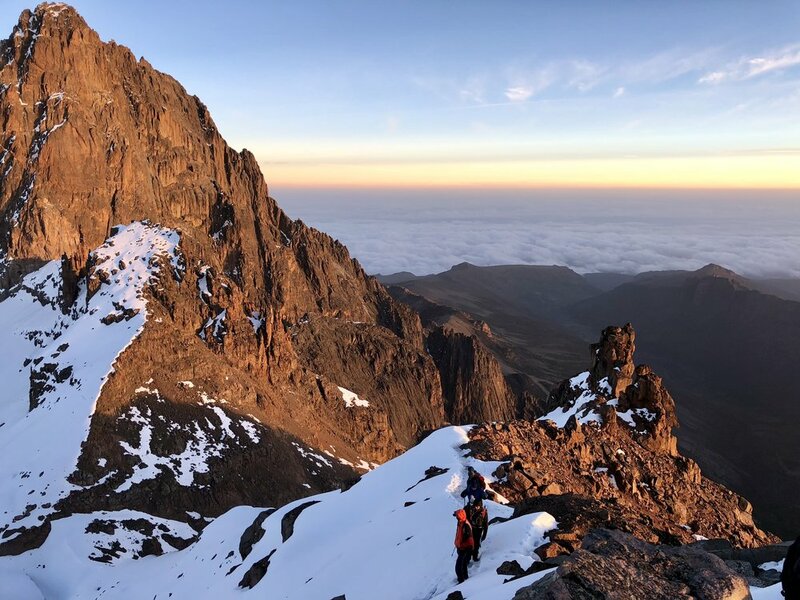 Mt Kenya can be climbed year round. The best times to travel are the summer season (June - early October), as these months often enjoy long dry spells and milder temperatures. December and January can also see stable weather and cooler temperatures. Most days trekking on Mount Kenya are 4-6hrs of undulating, uneven terrain. There are no technical sections on this route, so it is achievable for someone with good basic fitness and determination. Summit day is tough, sometimes involving up to 15hrs from leaving the tent to reaching the lower camp for the night.